With stark increases in the prevalence of Alzheimer disease (AD) and other age-associated neurodegenerative disorders projected in the coming decades, more tools are needed to accelerate research to combat these devastating conditions. Cleveland Clinic has augmented its efforts in this area by recently establishing a biorepository, the Lou Ruvo Center for Brain Health Biobank (CBH Biobank). By adding a major biorepository to the neurodegenerative research community, we will make more critical biospecimens available for the collaborative work needed to turn the tide on aging-associated brain diseases. The CBH Biobank is housed in Cleveland Clinic’s Genomic Medicine Institute and is supplied with biospecimens from the recruitment efforts of clinicians across the Neurological Institute. The specimens include biofluids (blood plasma and serum, urine, saliva, cerebrospinal fluid) as well as tissue samples (skin biopsies from live subjects and, eventually, brain tissue at autopsy). Ready access to such specimens is critical for translating basic science findings into better understanding of brain diseases and the development of biomarkers for use in diagnosis and treatment. Specimen collection has begun in earnest and includes samples from patients diagnosed with neurological disorders and their family members as well as from healthy, cognitively normal individuals who want to support research on neurodegenerative disease. Sample collection is accompanied by highly detailed characterization of the donor’s demographics, medical history, and clinical signs and symptoms. The result is a capacity to later match specimens to highly specific requests from investigators (e.g., plasma samples from AD patients under age 70 without a history of stroke). Figure. Schematic of the CBH Biobank’s operating process. Additional priorities include amyotrophic lateral sclerosis, frontotemporal dementia and normal pressure hydrocephalus. Moreover, we are exploring opportunities to study biomarkers for other neurological disorders, such as traumatic brain injury, underscoring the CBH Biobank’s utility beyond neurodegenerative conditions. We also intend to build on Cleveland Clinic’s long-standing leadership in neuroinflammation research — much of it coming out of our Mellen Center for Multiple Sclerosis Treatment and Research — by facilitating swifter translation of key basic science findings to biomarker research. Work to that effect is underway through recent Alzheimer’s Association grants to study neuroinflammatory markers in blood and spinal fluid. Drs. Bekris (left) and Leverenz examine a CBH Biobank specimen. The CBH Biobank stands to yield benefits beyond Cleveland Clinic’s neurological research enterprise or even the community of fellow investigators in our region. As more and more genetic studies require large sample sizes well beyond the capacity of any single center, multicenter collaboration is increasingly the rule — and the more contributors, the better. The addition of Cleveland Clinic’s CBH Biobank to the community of major brain disease biorepositories will make more specimens available for pooling and sharing, further accelerating the quest for breakthrough advances. 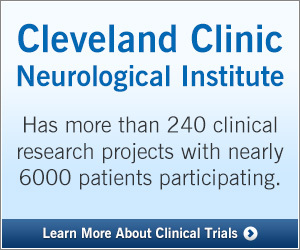 Cleveland Clinic is excited to be a part of biobanking efforts in neurodegenerative and aging-related brain disease. We look forward to opportunities to collaborate with colleagues running similar efforts elsewhere. Dr. Leverenz is Director of the Cleveland Lou Ruvo Center for Brain Health and Director of the CBH Biobank. He holds the Dr. Joseph Hahn Endowed Chair of the Neurological Institute. Dr. Bekris is an investigator in Cleveland Clinic’s Genomic Medicine Institute and Associate Director of the CBH Biobank.